Identification of factors that predict progression in MGUS, such as those described above, is important for individual patient management because the risk of transformation is life-long and the evolution of disease between individuals is variable. MGUS may evolve to other asymptomatic pre-malignant states with a significantly higher risk of progression (i.e. smouldering MM, smouldering WM, smouldering LCMM: Section 12.3). Disease evolution has been shown to be characterised by the acquisition of genetic mutations by tumour cell clones and associated changes in the bone marrow microenvironment (Chapter 19) . Light chain MGUS was proposed by Dispenzieri et al. as a separate clinical entity and the pre-malignant precursor of LCMM. The authors defined light chain MGUS as an abnormal κ/λ sFLC ratio with an increased concentration of the involved sFLC, no expression of monoclonal intact immunoglobulin, and an absence of end-organ damage that can be attributed to the plasma cell proliferative disorder. An example is shown in Figure 13.10. 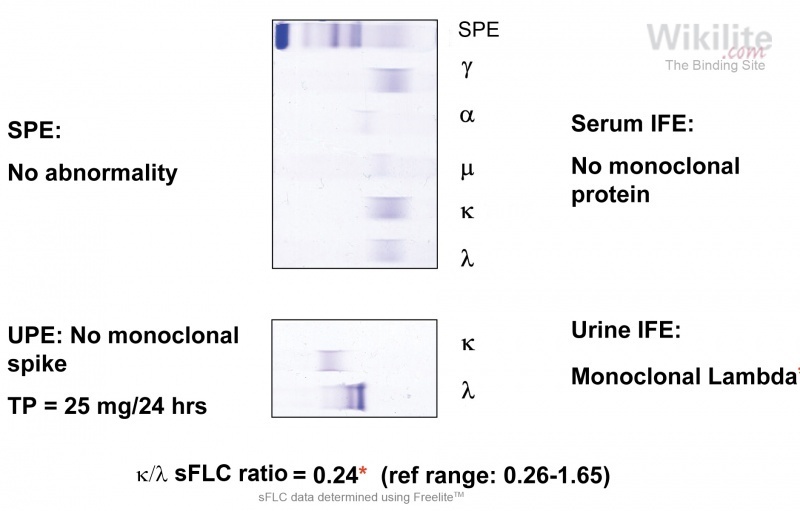 No abnormality was detected by SPE or urine protein electrophoresis (UPE), but an abnormal κ/λ sFLC ratio indicated the presence of monoclonal FLCs. This finding was confirmed by the detection of λ uBJP by urine IFE (uIFE). In the study by Dispenzieri et al. the prevalence and risk of progression of light chain MGUS amongst 18,357 residents of Olmstead County, Minnesota aged 50 years or older was assessed. 610 (3.3%) individuals had an abnormal κ/λ sFLC ratio, of whom 213 had an intact immunoglobulin MGUS. This included 57/213 additional patients whose monoclonal intact immunoglobulin had not previously been detected by screening with SPE, and so the prevalence of conventional MGUS in this population was revised from 3.2% to 3.4% (95% CI 3.2 - 3.7). Of the 397 individuals with an abnormal sFLC ratio but no abnormality detected by SPE, a total of 146 met the definition of light chain MGUS, equivalent to a prevalence of 0.8% (95% CI 0.7 - 0.9). This represented 19% of the total MGUS population; a proportion that matches the relative incidence of LCMM compared to all MM. The light chain type was identified as κ or λ in 108 and 38 individuals, respectively. Overall, involved sFLC concentrations tended to be low; only around 10% of patients had concentrations greater than 200 mg/L. It was noted that 23% of light chain MGUS patients either had or subsequently acquired, renal disease; an observation of relevance to the later proposal for monoclonal gammopathy of renal significance to be considerd as a separate entity (Section 26.4.1). A similar incidence of light chain MGUS (0.7%) was confirmed by the German population-based Heinz Nixdorf Recall study of 4702 individuals aged 45 - 75 years . Pelzer et al. studied disease progression in 75 light chain MGUS patients enrolled in the Heinz Nixdorf Recall study at 5 and/or 10 year time points. Although no patients progressed to overt lymphoproliferative disease (including LCMM), light chain MGUS patients had a 1.5-fold higher risk of having a coexisting solid tumour (p=0.04). Additionally, 3 individuals with progressively increasing sFLC concentrations developed conventional MGUS. There were no differences in overall survival between patients with and without light chain MGUS, but individuals with monoclonal λ FLCs had shorter overall survival compared to those with monoclonal κ FLCs and normal controls (p=0.01). During follow-up, light chain MGUS was a persistent finding in 45% (14/31) patients, but in the remaining 55% (17/31) of patients the monoclonal protein became undetectable. The authors concluded  that light chain MGUS is a relatively benign disorder with a high rate of monoclonal protein disappearance. 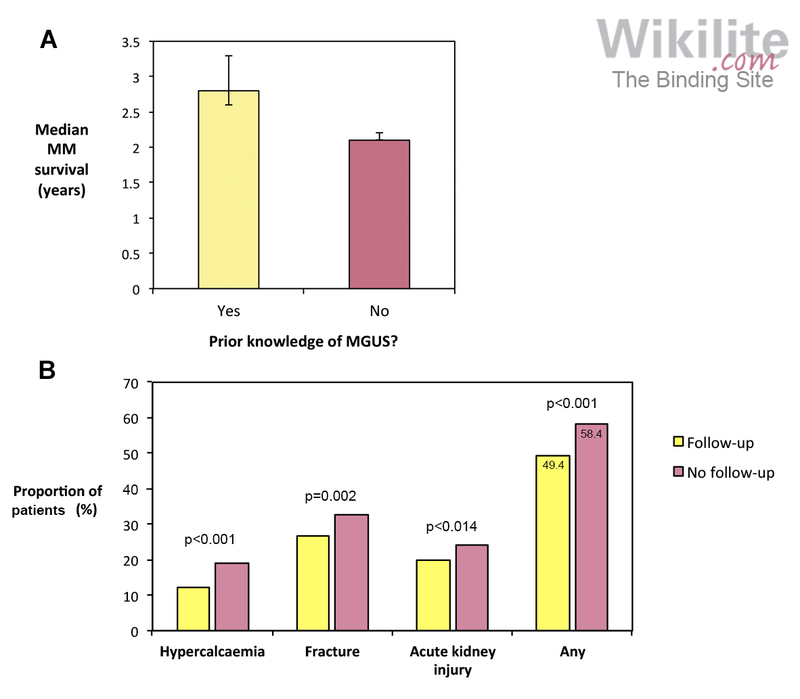 Which MGUS risk factors are included in international guidelines? 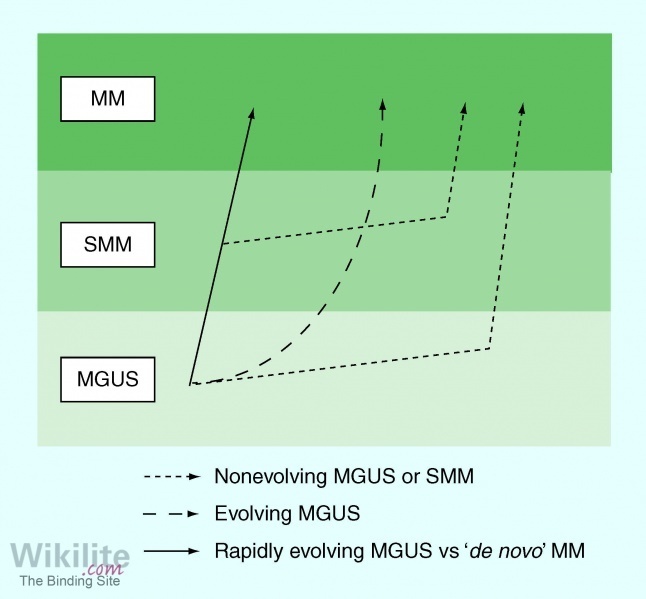 What are the clinical benefits of MGUS risk stratification? Why is light chain MGUS rarely seen with SPE and IFE testing of serum and urine? International guidelines recommend risk stratification based on three risk factors: an abnormal κ/λ sFLC ratio (<0.26 or >1.65), a high serum monoclonal protein concentration (>15 g/L), and a non-IgG subtype (IgA or IgM) (Section 13.2.1 and Chapter 25). Patients at high risk of progression can be more closely monitored, while low-risk patients whose results are stable can be discharged from follow-up clinics (Section 13.2.1). Because the amounts of FLCs produced are below the sensitivity of serum electrophoretic tests and are insufficient to exceed the proximal tubular reabsorption mechanisms and overflow into urine (Chapter 3).